written exam will be conducted for this AIIMS MBBS 2019 Course Entrance Exam. Written Exam for this AIIMS MBBS Course will be conducted on 25-05-2019 and 26-05-2019. Basic Registration course for this AIIMS MBBS Course registration will be strats from 30-11-2018. Last date for AIIMS MBBS 2019 Exam registration date is 03-01-2019. 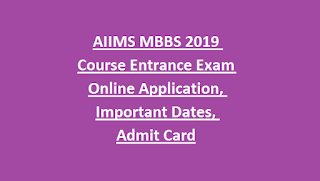 Admit Cards for this AIIMS MBBS Course 2019 will be available from 15-05-2019. Official website to apply online is www.aiimsexams.org. AIIMS MBBS Course 2019 age limits, qualification, important dates and other details are given below. AIIMS MBBS 2019 Entrance Exam will be conducted for filling the seats in all over India AIIMS Centers of Bathinda, Bhopal, Gorakhpur, Jodhpur, Bhubaneswar, Deogarh, Kalyani, Patna, Raipur, Rae Bareli, Rishikesh, Mangalagiri, Nagpur, and Telangana. AIIMS 2019 Entrance Exam will be conducted in various centers of all over India. 12th class or intermediate qualified or appearing candidates are eligible for attending this AIIMS MBBS Entrance Exam 2019. Online those who studied Physics, Chemistry and Biology subjects in intermediate or 12th class they are only eligible for this AIIMS MBBS Course recruitment 2018. Minimum age limit is 17 years for this AIIMS MBBS Entrance Exam 2019. AIIMS Entrance Exam 2019 will be conducted for 200 marks. Total 200 questions will be given. For each right answer one mark will be allotted. For each wrong answer 1/3 mark will be deducted. Exam syllabus will be 10th and 12th standard level only. Candidates have to prepare the NCERT books. Minimum qualifying marks are OC candidates 50%, for OBC candidates 45% and for SC/ST/PWD candidates 40%. Candidates who are looking for MBBS Entrance in AIIMS they can apply online on or before 03-01-2019. Admit card release date for this MBBS Course Entrance Exam is 15-05-2019. Official website to apply online is www.15-05-2019. 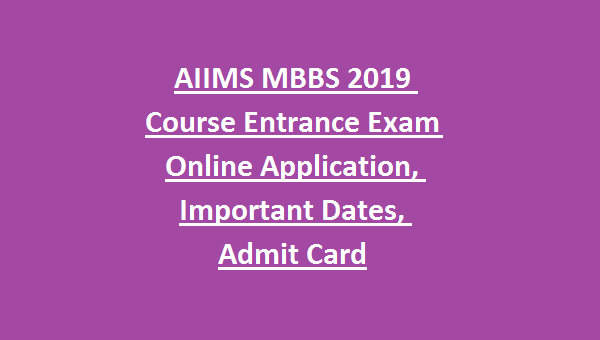 Admit card for AIIMS MBBS 2019 course will be available from 15-05-2019. Admit Card link is www.aiimsexams.org. AIIMS MBBS Entrance Exam result will be given in two formats on June 12, 2019.